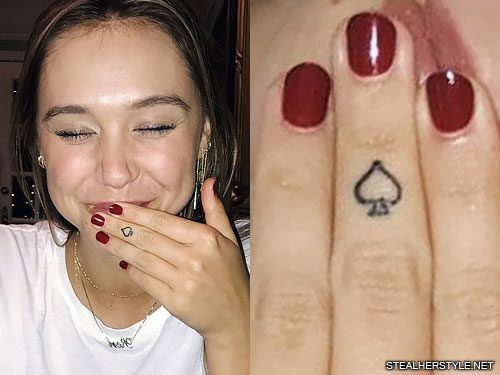 Alexis Ren already had an “ace of spades” tattoo behind her ear, but she added another spade logo ♤ in a more prominent location on her middle finger knuckle. 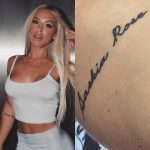 Both tattoos pay tribute to her little brother Ace, who is the baby of the family and is much younger than Alexis. 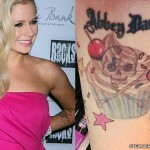 Rather than have the same tattoo in two places, she covered up the original spade behind her ear with a planet design. 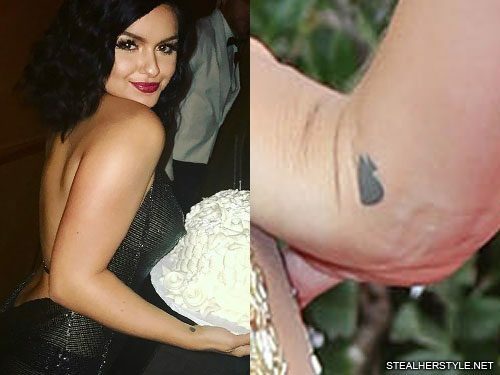 Ariel Winter has a tattoo on the inside of right wrist of the spade symbol from a deck of cards. 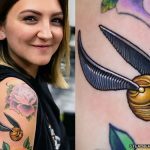 The inking is a tribute to her maternal grandmother Helen G. Batistas, who taught her how to play poker. 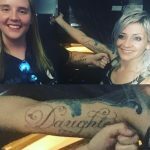 Ariel has had a complicated relationship with her mother Chrisoula, whom she has accused of both verbal and physical abuse, so her relationship with her grandmother was extra special. E! News reports that Ariel’s older sister Shanelle, who would eventually become Ariel’s legal guardian, was removed from her mother’s home temporarily at the age of 12 and placed in the care of their grandmother. Helen passed away from a massive stroke at the age of 72 in August 2010. However Ariel still holds a special place in her heart for her. “Yiayia we’ve missed you everyday since you left us in 2010. We love you so much.” she tweeted in 2015. 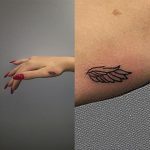 The timeline for this tattoo is a bit confusing. Ariel posted videos on her Snapchat while getting the tattoo done by artist Dr Woo on November 17, 2016, but she had previously talked about the tattoo in an October 2016 interview with ET. 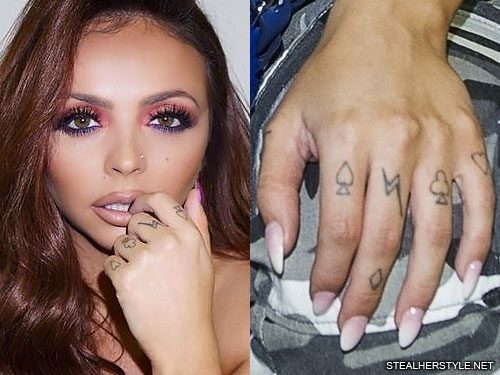 Our best guess is that she got the tattoo done at an earlier date and then had it retouched by Dr Woo in November. 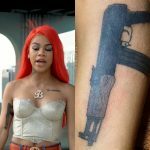 Whenever it was first done, we know that she had thought about getting a memorial tattoo for years beforehand. 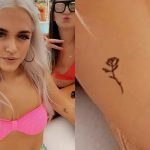 Back in October 2012, Ariel posted a picture on her instagram of a temporary tattoo that she drew with a marker of her grandmother’s nickname “yiayia” and her date of death. 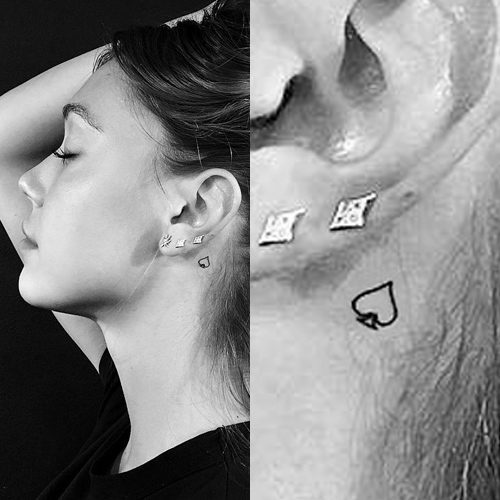 Alexis Ren has a tiny tattoo behind her left ear of the the spade logo (♤) from a deck of playing cards. The single spade, or ace of spades, represents her little brother Ace. Since their mother’s passing, Alexis’ two sisters have been taking care of Ace so that Alexis can focus on her modeling career.